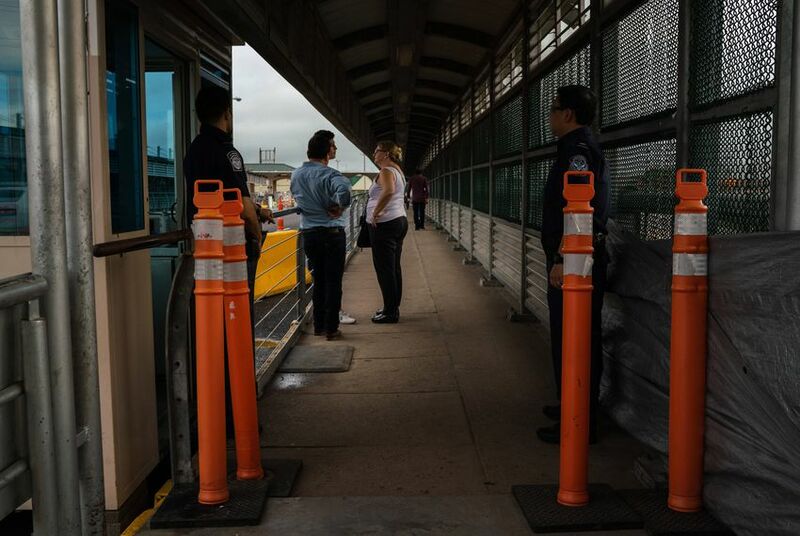 Agents on the McAllen-Hidalgo International Bridge now occupy a large physical barrier at the bridge's halfway point to manage the "influx of Central Americans seeking asylum." And lately, she's noticed a change: a big booth perched at the bridge's halfway point, where U.S. Customs and Border Protection agents are stopping and turning away asylum-seekers. "They cross running really fast, but then they get stopped," she said. And then they wait. "Sometimes they stay there [on the bridge] sleeping," Gonzales added. Agents have been standing on various international bridges at least since June, a practice that coincided with the Trump administration's "zero tolerance" policy to prosecute immigrants crossing the border illegally. That policy led to hundreds of children being separated from their families, creating a national uproar and a suspension of the policy. But the booth is a new twist. Customs and Border Protection (CPB) officials confirm that they've installed the booth, surrounded by orange cones, halfway across the McAllen-Hidalgo International Bridge so agents can stop travelers before they make it to the official port of entry on the U.S. side. CBP spokesman Rick Pauza wrote in an email to The Texas Tribune that the structures were placed on the bridge between four and six weeks ago as a way to maintain the “flow of legitimate trade and travel." He added that there are no similar midpoint booths at other South Texas ports of entry. It’s not illegal for migrants to seek asylum at ports of entry — indeed, it's a primary avenue for doing it. The Trump administration encouraged migrants to present themselves at ports of entry this summer, instead of illegally crossing the Rio Grande. Editor's note: The Texas Tribune and TIME have partnered to closely track the family separation crisis at the U.S.-Mexico border. This story is not available for republishing by a national news organization until Oct. 2 at 6 a.m. Texas news organizations may run it at any time. For more information email nchoate@texastribune.org.